In my last post, which was well received by everyone, I showed that human thought is system dependent on a non-material foundation, so much so that theism is simply a better grounding for human thought than non-theism. 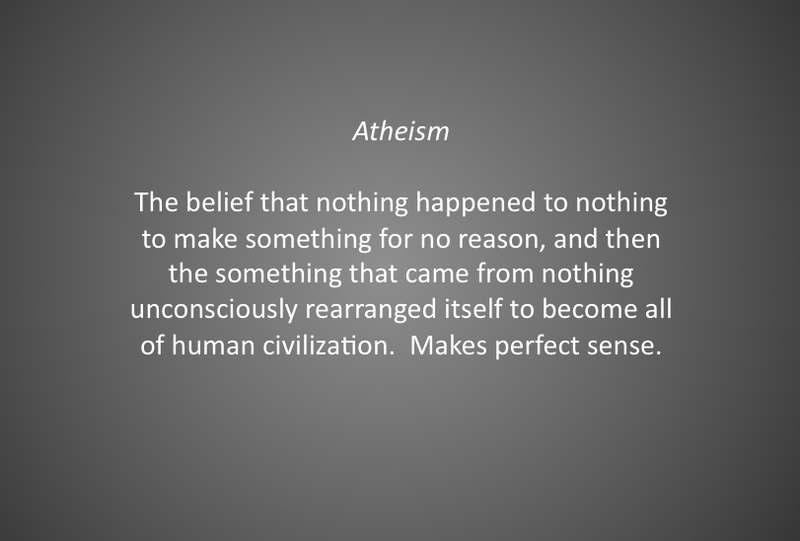 Non-theism is fundamentally self-contradictory. Likewise, atheism necessitates a belief in miracles, rendering atheism self-referentially inconsistent on a number of levels. There are at least three miracles in which all atheists believe. 1) Atheists believe that you can get something from nothing. Flying in the face of all physical evidence, atheists must believe that the universe sprang from nothing without cause. There is very little current debate about whether or not the universe had a beginning. But the claim that the universe could pop into existence from nothing seems to be the only cosmic hope of atheists. There’s simply no evidence that this happens in the material world. And so in choosing to believe in that which is impossible in a simply material world proves that atheists believe in at least this one miracle. 2) Atheists believe that will can arise from non-will. This is also miraculous. There is a significant blind spot in the atheist evolutionary account of human development, which is the anthropomorphism of inanimate matter. Natural selection weeds out that which is least likely to survive, and the drive to survive and replicate propagates the strong. However, this “drive” is fundamentally a description of a conscious will, which the atheist uses to describe everything, down to single celled organisms. The problem is simply that conscious will doesn’t exist in single celled organisms. Order couldn’t grow out of chaos through the selfishness of genes, because genes don’t have a concept of self. So the atheist is also committed to a miraculous foundation for design. 3) Everyone knows that humans are conscious beings, and that minds arise uniquely from brains. But think about how odd this actually is. There are all kinds of meat in the world. Your fingers are made of meat, but they aren’t thinking. The bologna in my fridge is meat, and it is not thinking. Consciousness is not at all necessitated by a material world, so much so that atheist philosopher Colin McGinn has thrown his hands up in the air and said that we don’t currently have the cognitive nor scientific capacity to grasp why consciousness exists. That is simply a atheism of the gaps which acknowledges the miracle of consciousness. So just as I showed in the last post that human thought rests undeniably on an immaterial, moral foundation, so also atheism rests on a kind of suspended disbelief. And suspended disbelief by any other name is still faith. So those who reject the supernatural can do so only on the basis of miracles, and atheism has again proven itself not only implausible, but impossible. None of the atheists who have commented here have answered your questions. So long as there is no answer to the question ‘how did matter arise’, we can safely assume that something other than matter generated it. The challenge for theologians like you, however, is to define in precise terms what the nature of God is, without playing the escapist. I am not a Christian, I am a Vedantin (Hindu). The idea in our tradition is that the visible and experiential universe is actually a vibrating awareness – the One or God. When God ceases to be in motion and goes to ‘sleep’ (stops all vibrations, willfully) the Universe ceases to exist and then God alone remains. You claim Atheism is the belief that nothing created the universe, whereas you (presumably) believe there was once nothing, but God existed in the nothing, but was God nothing? Was there anything before God? If so, how was God created, but if not how does this square with the fact that there was nothing before the Big Bang? How exactly did God create the universe from nothing seeing as he had nothing to work with? If you mean that seriously, the law that nothing comes from nothing is a property of physical matter, and God is not physical matter. Christianity: The knowledge that a wizard did it. So without any response to the fact that it was obviously created, the only thing you can think to do is make fun of the Creator? No. I’m making fun of YOU. Making fun of a fictional being is much less entertaining. And I can think of many other things to say, but to someone who uses statements like “obviously created”? Nope, sorry. Wasted time and effort. Just makes it all the more clear you don’t have an answer. I’m in for the questions and don’t claim to have all the answers. You’re the one for taking the first answer that comes by and declare it holy dogma. But, if you would like to expand your horizon beyond the bible, google is your friend and you’ll find enough stuff on how that whole “obviously created” stuff doesn’t make any sense. But, honestly, I don’t think you’re ready for that.